Providing informal caregiving services for a loved one is common practice for millions of Americans. It is also common for family caregivers to suffer the negative impacts of caregiving that can affect their everyday well-being. Informal caregivers often experience high levels of stress, lack of sleep, and overall poor health. This impacts their careers, families, and even the ones receiving the care. At Assisting Hands Home Care, we offer respite care services to give informal caregivers a much-deserved break. We will work around your schedule to get you the time away that you need. Out of the 65 million+ Americans who provide informal caregiving services for a loved one, roughly 25% are in poor health themselves. Roughly 2/3 of all informal caregivers are women. Lack of sleep, increased responsibilities, and added stress are the primary contributors to poor health. They can impact careers, families, and even the quality of care being administered. By recognizing these statistics, we hope that you can better manage your schedule and expectations, and prepare for the road ahead. We can help you as frequently or infrequently as needed with our respite care services. At Assisting Hands Home Care, we do everything possible to make our respite care services flexible and effective. We understand that everybody has their own needs, which is why our services are completely customizable. We can help on a recurring or case-by-case basis. Either way, we will strive to provide optimal caregiving services, and give you the much-needed break you deserve. To learn more about our respite care services, or to schedule an appointment, contact our caregivers at (847) 915-6186. 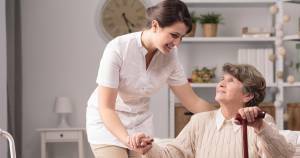 Our Assisting Hands Home Care caregivers are professional, personable, and highly trained to provide excellent care and companionship. We look forward to getting to know you soon, and providing the kind of care that your family deserves.